The sweet state of the Indian car market is attracting all allied businesses to it like bees to a hive. You are probably aware by now that Kia is aiming to set up shop in India by 2019 and their flagship vehicle could very well be one of the early models to reach our shores. 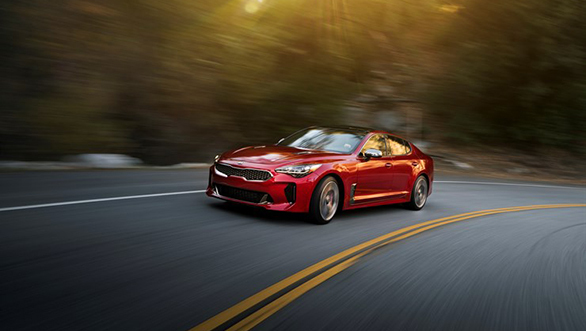 They call it the Kia Stinger GT and like a queen bee, it will sit at the top of Kia's ecosystem. Its job in India won't be to sting the competition but to act as a halo model that showcases the capabilities of the Korean brand. In Europe however, it takes the fight straight to the German sports sedans. Justifiably then, we were given a chance to drive the Stinger in Germany ahead of its European launch. I was hoping to drive the car at the Nürburgring - the fabled racetrack that was instrumental in the Stinger's development. But my brief two-hour drive was restricted to some back roads around Frankfurt and yet, I returned impressed. The Stinger spawned from the GT Concept that Kia showcased in 2011 and Kia's chief design officer, Peter Schyerer (the man who designed the first-gen Audi TT), told us how happy he was that the production car retained some of the concept's striking design elements and shapes and the sleek, four-door-coup form. The sweeping roofline of the Stinger is a nod to European GT cars of the 60s. 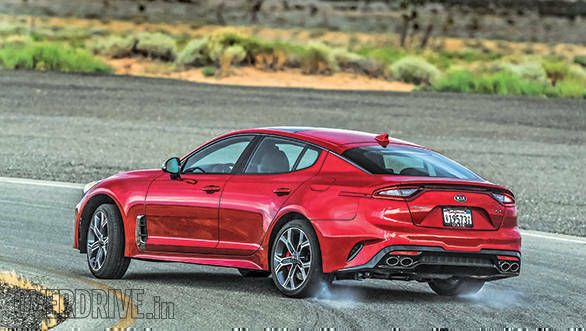 The silhouette reminds me of the Audi A7 and while the Stinger isn't as sleek as the BMW 6 Series Gran Coupe, it has a similar nose-up stance. 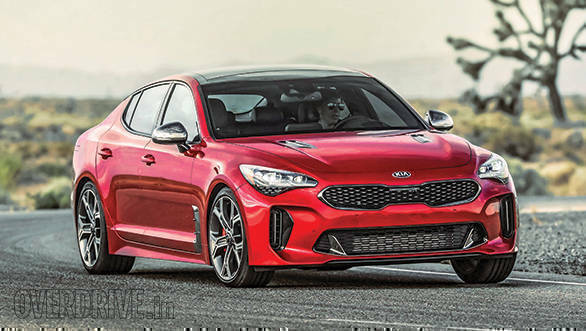 Speaking of which, Kia's signature tiger nose looks great on the Stinger while the mesh pattern seen in the grille, air dams and even the headlight detailing, adds a hint of sophistication to the fascia. The gunmetal finish for all the bezels and the wing mirror caps looks nice and in my books it tastefully trumps the bling of chrome. The tail isn't the prettiest angle for the Stinger, but the sleek taillights of this car are something that the Europeans could end up seeing often. Step inside and you will be surprised at the design and the quality of the cabin. It isn't trying too hard to be sporty. No flashy inlays or bright upholstery in here. The layout is simple and smart. The instrumentation, its layout and the fonts have a strong resemblance to previous generation of Audi sedans. The infotainment software and its layout does remind me of the higher-end Hyundai cars, but it uses darker colours for its user interface. 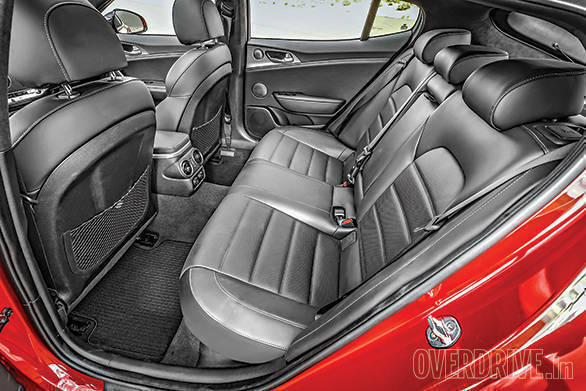 The cabin is pretty spacious and you sit a bit low with the dash wrapping around you like a typical sports sedan. It even has the numbers to rival this category of cars and make you rethink about your brand loyalties. The Stinger is available with diesel and petrol engine options and the range-topper petrol we drove got its motivation from a 3.3l turbocharged V6 engine that is borrowed from Kia and Hyundai's luxury sibling, Genesis. It produces 356PS of power that helps the 1.9-tonne sedan crack a sub-five second 0-100kmph sprint. Depending on the drivetrain you choose, the power can be put down to the road via a four-wheel-drive system or a classic (and more fun) front-engine-rear-wheel-drive layout. As mentioned, my drive did not involve as much fun on the monitored backroads of Frankfurt. But a brief stint on the autobahn was a foretaste into the Stinger's capabilities. Kia claims that the Stinger 3.3 will hit a top speed in the vicinity of 270kmph and the endless power delivery I experienced on the autobahn makes me believe that claim. What further cements my belief in this car's capabilities is the fact that the dynamics have been fine-tuned by Albert Biermann - a top engineer who was picked by Hyundai and Kia from BMW's M division. With the Stinger GT he wasn't aiming to create an M3 rival, but one that can certainly give most sports sedans a run for their money. And looks like it has worked. The Stinger GT feels nimble and quick. It has a limited slip differential and an e-diff is under development too. The torque converter gearbox on my test car didn't feel as quick as an Audi DSG or as telepathic as any new age BMW gearboxes, but it gets the job done pretty well. Around faster switchbacks or racetracks though, it may be not as efficient as desired and this could be the weak link for this car. The steering is surprisingly good and feels quite precise in its operation and complements the intent of the Stinger quite nicely. The progressive brakes and the grippy tyres contribute further to make it a formidable package. 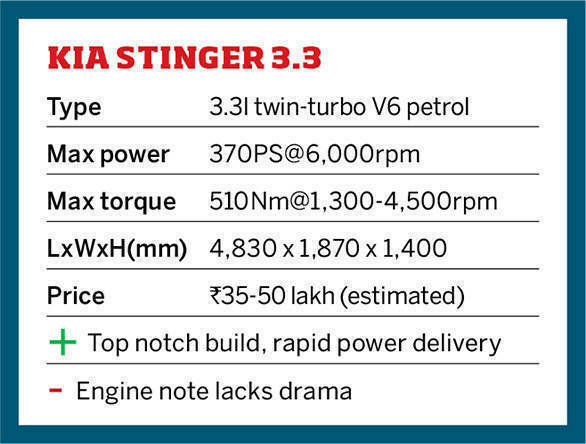 As I mentioned earlier, the Stinger intends to declare war on the European sports sedans like the BMW 3 Series and the Audi A5, but its priorities in India will be quite different. 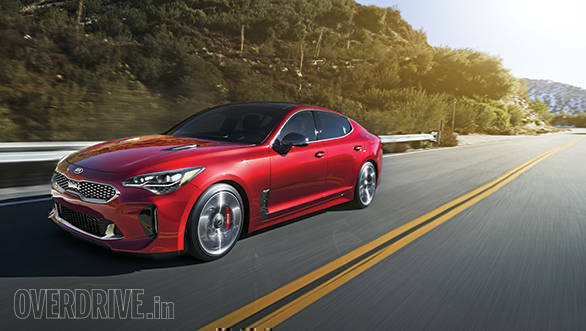 What's worth noting though is that, Kia say the Stinger GT's design and dynamic capabilities will filter down to the cars lower in the segment too. So if the Stinger is a sign of things to come from Kia, it certainly looks positive for enthusiasts like you and me and is probably a welcome change over what we have experienced with commuter Korean cars so far.